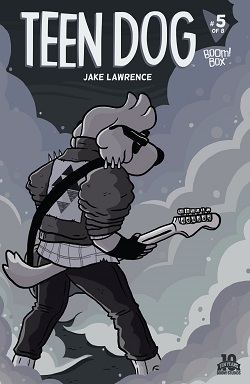 Teen Dog, a goofy yet sweet comic written and drawn by Jake Lawrence, triumphs in boldly eschewing many staples of modern comic book storytelling in leaving out intricate, overarching stories and anything else that doesn’t directly lead to fun and endearment. Even something like Lumberjanes, as swell as it is, opts to weave a mystery-laden tale that requires concentrated month-to-month reading to understand; Teen Dog doesn’t bother. Sure, despite each issue being mostly self-contained, there is an ongoing story to follow, but it’s all to-the-point and easy-to-follow. Because of this, nothing gets in the way of instant joy in this series, a trend continued in the fifth issue. The loose focus of this issue is Teen Dog’s confrontation with his “evil” doppelganger, Dark Teen Dog, and the battle of the bands contest they and their respective friends find themselves in. It’s our protagonist’s humblest issue yet as he learns the value of hard work and practice, which is relevant to everyone regardless of just how cool they may be. There’s some slight disappointment to be had by the considerably civil confrontation whenever it finally happens, given the small bit of build-up from last issue, but there is some cleverness and charm to what readers get. Besides the main part of this comic, all of the stapled smaller moments and interventions found in this issue deliver wonderfully, always managing to be cute and downright hilarious. From the most existential and philosophical answer to the question “So do you like music, Jennifer?” to a sneaky Legend of Zelda: Ocarina of Time reference, I couldn’t stop laughing for long as I read through this issue. It’s the little moments that shine in Teen Dog, and this issue is filled to the brim with those, just like the previous entries. Lawrence’s illustrations continue to impress, with all of their bold, popping colors and silly expressions. There’s a certain kind of whimsy to the visuals too, thanks to the rounded edges and that great use of bright colors. There unfortunately aren’t any splashes in this issue unlike some past ones, but there is still a lovely few panels on the first page without any dialogue. Teen Dog rocks, and kept rocking with #5. It so effortlessly and casually manages to be a friendly, funny read.